Frustratingly, we are still fighting the Flea Army. I think the dogs are more than 50% free of fleas now, but we're still combing, bathing, washing laundry, and vacuuming, and we've even got a flea killing spray now. Hopefully it won't take much longer, but we could be in for another two weeks. Understandably, between the Great Flea Invasion and play rehearsals, my knitting output has slowed some. I've gotten a few more rows done on the body of Finn, but it's still a few inches from being done, and I have to double-check my sleeve math. My Work + Shelter Lace Striped Tee is still marching on, and I'm still charmed by it. I've got just one more stockinette band before I start the sleeves, and even though the rounds will get really long once I put everything together, the rest of the top should just zoom right along. I've got several skirts that I think will look amazing with this tee, so I'm really excited to be getting close to the finish. Oh, man. I hope you all had a good weekend, because mine passed in a bit of a blur. Saturday was designated "flea-killing day"-we vacuumed everywhere, did a ton of laundry, and gave the dogs their second flea baths of the week. So far everything looks good, and I haven't seen a single flea since Saturday afternoon, but I'll still be on guard for a while. Saturday evening I went for my first >20 mile training ride, and it was just what I needed. I got one of these for my handlebars, and it's made such a difference. I need to remember to keep my shoulders back and my neck long, but my hands and wrists feel so much better, and it definitely made the ride more enjoyable. I feel like I'm in a pretty good place now, and Saturday's ride went so well that I'm looking forward to these last days of training. I'd been really anxious about crossing the 20-mile mark; an old cycling teammate of mine loved to say that if you could ride 20 miles, then you could ride 50 miles, so this is a huge psychological burden off my mind. I promise, I did get some knitting done this weekend, but it was mostly done during our read-through on Sunday evening and I haven't managed a photograph yet. It was a long rehearsal yesterday, and I'm not quite used to the schedule yet, but I'm so happy to be back in theater mode for the summer. I feel like I've been waiting ages for play rehearsals to start, and just yesterday I realized that our first rehearsal is this coming Sunday! Of course, I'm very excited to start working on this show, but I'm also feeling a bit of a crunch since this will be my last free weekend for a while. I've got quite a bit that I want to have done before rehearsal on Sunday so that I can feel like I'm starting off this theatre season on the right foot. I've been having trouble deciding on rehearsal knitting this year, but then I remembered that I (fortunately!) have left my poor TPCT languishing for the last few weeks. This will be just the thing I need, at least for this first week-plain stockinette, easy to pick up and put down, perfect for knitting just two or three stitches or a dozen rounds at a time. All my other projects are a bit fiddly right now. I need to double check some sleeve math for Finn, and I'm just a stripe and a half away from starting the sleeves on my Work + Shelter Tee. I was going to just bring a sock with me on Sunday before I remembered this top, and I'm definitely more excited for a crop top right now than wool socks! This weekend has been full of backwards progress and near surrender. Over the past week I've been working very faithfully on my Finn cardigan in the evenings, and the body was just a few rows from being done when I realized there was a huge color change when I joined the new skein. Friends, I had to rip out over 50 rows of progress, and I was not happy. I'm still not happy, but all I can do is keep plugging along and know that it'll be better for this setback. Yesterday I did another training ride for the Tour de Cure, and friends, it was a hard one. I decided to ride to the river eight miles from my house and back, and the whole way there I was riding into the wind. My hips hurt, my neck hurt, my back hurt, my elbow hurt, my knee hurt. My hands and feet got tingly and went numb, and I wanted to stop at least three times before making it to the river. I cried. It was not very dignified. But I kept going. Because it wouldn't mean anything if I'd given up. Sure, any riding is better than no riding, but I needed to fight through it. And it was hard, and it really sucked, but the Tour is in three weeks, and I'm going to be riding 50 miles, which is longer than I've ever ridden. And I don't know if I can do it. In fact, I won't know for sure if I can do it until it's done. I didn't know if I could finish yesterday's ride, either. And that's why I kept going. Because I never know how a day is going to go-if I'm going to have a crazy low and be out of commission, or if I'm going to be crazy high and need to take extra insulin every hour. I never know what's going to happen, and I never get to give up and just not be diabetic for a day. I want this tour to mean something, I want to face the uncertainty, and I don't want to give up. And having all of you supporting me just makes me more determined to fight through these hard rides. So again, thank you all so much. Because when I was a mile from the river, crying and in pain and ready to call my dad to come pick me up, it was the thought of your support that kept me pedaling, and I know you'll all be with me through the ride on July 9th. I was fortunate enough to be the grand prize winner for the indie.knits Nusa KAL, and since it's such a lovely prize package, I thought I'd take a minute to share it with you! The grand prize included print and pdf copies of three of Cory's patterns-since I'd already bought and knit two of the ones she'd initially identified for the prize, she was kind enough to allow me to swap out for two different ones. I ended up with the patterns for her Lelia Mitts, Cairn, and Wayward. They all look like wonderful, delightful knits, and I already have yarn for Wayward and Cairn, just as soon as I find time to cast on for them! I don't really own any print patterns unless they come in a book or magazine, so these are a lovely treat, and I'll have to figure out the best place to keep them. I'm a huge fan of Cory's design sensibilities in general, and the paper, print quality, and layout of these patterns is beautiful. The prize also included two skeins of Three Fates Yarns aquae singles in colors of my choice. I've been a huge King Arthur fangirl for most of my life, and I was feeling a bit romantic when I was browsing the possible colorways, so I went with Arthur and Guinevere, and they really do look charming together. I'm already hatching a plan for these two skeins, and hopefully I'll have time to knit them up soon! I also got another Three Fates Yarns logo project bag-I love the size and drawstring of these bags, so it's definitely going to be handy to have two around! Thanks again to Cory for a wonderful KAL and such a fantastic prize package! 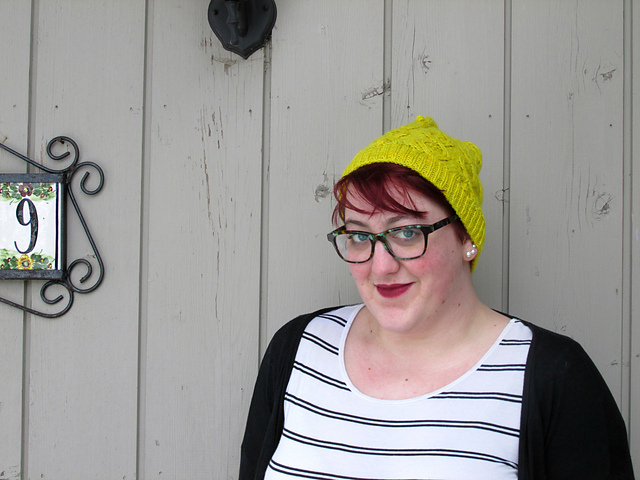 My new cowl pattern, Cerchiate, went live this week! This one's been in the works for a while, but I'm so pleased with the end result. I've had this skein of Malabrigo Sock in my skeins since my second year knitting, so it's been lurking for a while, and sometime last year I started brainstorming ideas with it. I finally started knitting in March, and then this got set aside for the rest of spring. I pulled it out again a couple of weeks ago, and fell back in love. As I mentioned earlier, I was heavily inspired by the colors in this skein and by the play The Tempest. I really wanted to play around with the color changes and show off the depth of the yarn, and I'm so happy with how everything came together. Cerchiate is available on Ravelry and in the wayward knitter pattern store. It's worked flat from a provisional cast on, then grafted, and as always, the lace patterns have both charted and written instructions. This weekend has been a bit of a frenzy, but the heat is finally breaking today and we should cap out somewhere in the mid-eighties. I ended up going with Plan C for my Shakespeare Festival knitting, which was bring the Work + Shelter Lace Striped Tee that I cast on with my Que Sera leftovers at the beginning of May. I'm really happy with that choice-the cotton/acrylic blend was definitely nicer to handle than wool in the heat and humidity. Sadly, just before the end of intermission I noticed the cable breaking off both ends of my fixed circular needle, so I had to spend Act 2 knitless. It's moved to my trusty Knit Picks interchangeable now, and hopefully I'll be able to zip through it (and no, for those of you keeping score at home, my TPCT is still not done yet). I managed to make it through the photoshoot for my new cowl pattern, and I am so thrilled with the results. I wish I'd had a bit more time to play around, but I lasted just long enough to get the shots I needed, and then it was back inside to lay on the floor next to the AC output. That pattern will go live this week, so stay tuned! I've been on a poetry kick this weekend-I finished the Preacher series on Friday evening, and since then I've been working through a few different writers that I love-Warsan Shire, Sonya Taaffe, Catherynne M. Valente. I've been reading poetry since I was a kid-it's pretty much the only thing I ever had in common with my paternal grandmother, and it's nice to come back to every so often. It's too hot to do anything right now. I think the next five days are all supposed to be well into the nineties, and then we'll get a reprieve in the mid-eighties. You know it's sad when the mid-eighties is sounding good. Summer stinks. I finished the puzzle, except for gluing, It went by quicker than the last one, mostly because it's been too hot to think about doing much else. For those of you who wondered, no, I don't knit and puzzle at the same time. I tend to get really hyperfocused on the puzzle, and don't want to distract myself with knitting, and I need my hands free to try out where pieces might fit. I promise, there is still some knitting happening. My new cowl pattern is done and ready except for photos, so I get to go out this weekend while it's a billion degrees out and wear wool around my neck and try not to look like a melting sweaty blob. I'm almost at the heel flap on my first Neon Sock, and I still have my TPCT and a couple other summer tops I'm thinking about. I've got a new puzzle going this week. The Star Wars Comics puzzle I was working on the other weekend is glued and framed, and that's the plan for this one too. I do have two more puzzles in the queue, but so far I'm just planning on solving them and then dropping them off at the thrift store-I don't have nearly enough wall space to frame and keep every puzzle I buy! I haven't had too much knitting time since this weekend, but I'm still making slow, slow progress on my TPCT. It's supposed to finally get up into the mid-to-upper-nineties in a couple days, and I am not ready for it at all. There is nothing about near hundred-degree weather that I like, and since this weekend is the Shakespeare Festival, I'm going to be sitting outside every evening. I'd been hoping to crank out more of this, but since it's going to be too hot, I might have to just bring a sock so I don't have to sit with a lap full of wool. Look! A wild pair of socks in their natural habitat! The weekend was a total success, both in terms of sister time and sock knitting. Friday night karaoke was a ton of fun. Most of the university students are gone for the summer, so the town is nice and quiet and there was only a dozen or so people at the bar for karaoke. It was pretty laid back, and pretty much everyone got to do two or three songs. The rest of the weekend was a mix of thrifting, book shopping, movies, and vegging out. I worked on the leg of my neon sock at karaoke, and the rest of the time I trucked through these plain socks I'd been working on for my mum. I cast these on back in December, but they've been languishing for the most part since then, cast aside in favor of larger projects. I am very happy to be done with these, and I'm really glad to have reconnected with sock knitting. I do love my shawls and sweaters and cowls, but there's something so comfortable about banging out a pair of socks. It's one of my goals this year to get back into regular sock knitting, and I think this is a good step forward. Yarn: Premier Yarns Deborah Norville Serenity Sock Weight Prints "Aquamarine"
Normally, I don't plan too much for my weekends. Some Netflix, lots of knitting, chores. I'm a pretty low-key gal. But I've actually got some fun plans brewing for this weekend, and I think we'll probably come up with more before I get done with work today. Anemone's coming to visit this weekend, and initially we were planning on just hanging out and marathoning Harry Potter. Then I remembered there's karaoke on Friday nights. So, okay, we'll do karaoke. Then, since the Shakespeare Festival is next weekend, the town's doing a bit of a gear-up week, and the classic cinema downtown is doing a free showing of Joss Whedon's Much Ado About Nothing on Saturday morning. So, we have to go to that. The rest of the weekend is so far dedicated to watching the extended Lord of the Rings trilogy, but there's still room in there for other fun things to pop up. Since I've been feeling the urge to knit socks this week, I'm going with it. I'll bring a sock to the bar to work on during karaoke. Socks are also dedicated cinema knitting, and since we'll be at the cinema on Saturday morning, I'll have to bring a plain sock. My TPCT is probably only about half done now, and I'm sure I can crank out most of the rest of the body at least while watching LOTR, but I'll change it up by swapping between that and one of my patterned sock projects. I'm feeling a bit...adrift, right now, in terms of blogging. I'm juggling a whole lot of different projects, and I certainly have no shortage of things to blog about, but I'm starting to feel a bit jarred by how quickly I flit from thing to thing. I've always been flighty like this, and from the very first day I learned how to knit, I knew I was going to have to juggle several projects to avoid getting bored. So what's my focus this week? I finished up the sample for my new cowl design, and it's blocking now and I'm getting the pattern written up. Having not done any pattern writing since winter, it feels really good to have this one almost ready. I took the whole spring off of design work, giving myself a rest and trying to focus on what it is I want to be doing and what I want to be making, and I'm definitely feeling better for having taken that break. I'm slowly but surely making my way through the body of my Finn cardigan sample as well, and trying to finish up my TPCT before I get too deeply wrapped up in the OAL. Surprisingly, I've also been feeling pulled back towards sock knitting. I was a really big sock knitter in college, when I had 21 hours of class each week, and small projects were easy to carry around to class, but I've knit fewer and fewer pairs over the past few years. Lately though, I've been drawn towards fun sock yarns, and I've been feeling like maybe it's sock time. Goodness knows, out of the four pairs I have on the needles currently, it probably wouldn't hurt to pick one or two back up. Also, because apparently I can't hold myself accountable to anything unless I blog about it, I went on a 10.5 mile training ride last night. My bum is still not thrilled with me, but it's coming around. Continued thanks and love to everyone who has either donated or cheered me on (or both! )-you guys are my blog family, and I couldn't do this without you.